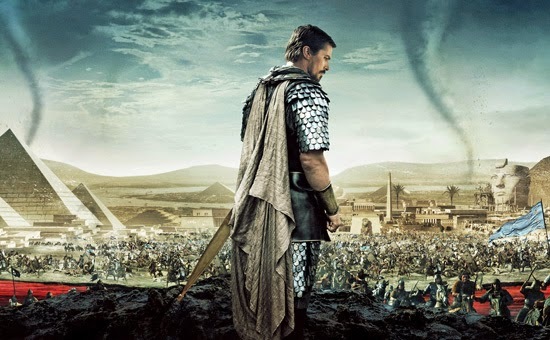 Ridley Scott’s new film “Exodus: Gods and Kings” features Moses, the Pharaoh, hundreds of thousands of slaves making their way across the floor of the Red Sea, all ten plagues, the burning bush, and even the angel of Yahweh in the form of a petulant eleven year old boy with a British accent. And yet, the movie is spiritually flat, as though its makers had read the Biblical story but understood precious little of its theological poetry. The problem is the way the relationship between Moses and the God of Israel is presented. In the Biblical telling, Moses, like many of the other heroes of Israel, was compelled to pass through a long period of testing and purification in order to prepare himself to receive the divine word. Only when he had been sufficiently humbled and purified was he able to take in the presence of God and to accept the dangerous mission of liberation that God gave him. Ridley Scott’s Moses did indeed spend years in the desert to the east of Egypt, but he seems little changed from the self-absorbed, violent, and worldly prince of Egypt that he had been. And thus, he accepts the angel’s charge, not with joy and spiritual enthusiasm, but with a kind of resentment. And whenever the child appears to Moses in the remainder of the movie, the liberator seems annoyed, put upon. In the book of Exodus, on the other hand, Moses is utterly fascinated by God and drawn ever deeper into union with God’s mind and purpose. So transformed was he after one encounter that his face shone with the brightness of divine glory. How far this is from Christian Bale’s brooding Moses who seems to wish that God would just leave him alone! This misconstrual of the rapport between God and Moses leads to a second major problem with Scott’s film, namely, the reduction of the Exodus to the story of political liberation from a tyrannical system of government. Never does Scott’s Moses tell the people that their God had directed him to free them, and when the tribes of Israel make their way successfully across the Red Sea, no one mentions God or breathes a word of thanks to him. On the Scriptural telling, of course, the crossing of the Red Sea is followed immediately by an ecstatic song of thanksgiving: “I will sing to the Lord, for he is gloriously triumphant; horse and chariot he has cast into the sea. My strength and my courage is the Lord, and he is been my savior…Who is like to you among the gods, O Lord? Who is like to you, magnificent in holiness?” (Ex. 15:1-2; 11) In point of fact, that last line is, arguably, the key to interpreting the entire book under consideration. Seen aright, Exodus is not telling a story primarily of political liberation (though that is part of it), but rather a story of spiritual liberation from false gods. It is crucially important to note that when Moses first approaches Pharaoh—in the Bible, not the movie—he asks that his people might be freed so that they could worship the true God. The implication is that Israel has been enthralled, not only to an oppressive political leader, but to a false and corrupt religious system, which has compelled them to worship in the wrong way. When Pharaoh refuses, God visits upon Egypt the famous plagues, and we have to see that these are not simply arbitrary wonders of nature, but rather challenges to false gods. The ancient Egyptians worshipped the Nile as a source of life, but the God of Israel turned it to blood, killing off the life within it and sending forth from it, as a consequence, the plagues of frogs and gnats. They also honored the sun as a god who gave light to the world; but the God of Israel darkened the sun, visiting darkness upon the land. Finally, they worshipped the Pharaoh and his family as divine avatars, but Yahweh took the breath of life from Pharaoh's son and left the king himself utterly defeated. With all due respect I found the movie to be very spiritual. Perhaps the theology wasn’t as developed as the highly reflective version found in the Bible. But, the movie drew me into the struggles, doubts, and confusion of a real man realizing God working in his life and the impact this had on the people around him. Anyone can enter a parted sea, but it takes faith and trust to wade into a flowing sea, especially with your family and friends behind you. I can’t help but contrast this extraordinary act of faith with Moses’ initial agnosticism developed in the movie through the dialog with his wife and son. As I watch men come through our RCIA process I can’t help but take joy in watching their antagonism transform into real belief; watching them begin to take charge of their family’s faith. To me, the determination in Moses’ face as he rode with the Ark in the wagon in the final scene was the look of a man who knew God and cherished it. I think this movie is a gift to the New Evangelization. I found exodus to be quite boring. It did nothing for me. The boy at the burning bush made no sense at all. The movie was set too dark and dreary. The wrong actors were chosen. They should have been black actors since these people of that nation were Africans. The movie with Charleston Heston had the wrong race of people also but it was more entertaining than this one. This movie was a waste of money all around. I should have waited for it to come on regular TV. Spend your money if you want but you will be disappointed.
" And thus, he accepts the angel’s charge, not with joy and spiritual enthusiasm, but with a kind of resentment." When is the last time you read the encounter between Moses and the Burning Bush in Exodus? Moses did not accept the angel's charge "with joy and spiritual enthusiasm", But with great reluctance. "But behold, they will not believe me or listen to my voice.... Oh, my Lord, I am not eloquent, either heretofore or since thou hast spoken to thy servant; but I am slow of speech and of tongue. ... Oh, my Lord, send, I pray, some other person." Then the anger of the LORD was kindled against Moses.... Then there is the strange incident of Exodus 4:24-26, in which even after having (reluctantly) accepted the charge, Moses had failed to circumcise his son -- it was left to his wife Zipporah to save the day. I have no plans to see this movie; I have heard too much against it. Showing Moses as imperfect and reluctant is not one of its problems, though. Much more problematic is a watered-down Marcionism that pooh-poohs "the God disclosed in the Old Testament", as though the Old Testament were inspired by someone other than the same immutable Holy Spirit Who inspired the New Testament and Who safeguards the Magisterium. The tone of my previous comment comes across much more harshly than I had intended. I should have said something like, "Are you kidding?" rather than, "When is the last time you read the encounter between Moses and the Burning Bush in Exodus?" Of course, that passage must come up regularly in any priest's prayers and readings. I intended to express dismay at the idea that Moses set off with joy and enthusiasm, but I did so badly. It is in the second paragraph where I really should have been more careful, though. No, I do not think Fr. Barron is a Marcionite. However, the disease of chronological snobbery is endemic to our age, and too many people use the facts of progressive revelation and the development of doctrine as an excuse to ignore any part of revelation that they feel uncomfortable with and that was given before they were born. This sort of thinking must be resisted vigorously; once we give in to it, we stop being Catholics and become something like Unitarian Universalists, just making things up that neither we nor anyone else can or should believe. So if my picture of God seems inconsistent with the Old Testament, it's not because the Jews were so stupid and spiritually inferior to us that they could get little right about God other than that He exists and that there is only one God, it's because my picture of God is wrong and in need of correction.